Our entire team is at your disposal during your conventions or exhibitions, and will be very happy to welcome you to the ibis Lyon Caluire Cité Internationale hotel. The ibis Lyon Caluire Cité Internationale hotel is located to the north of Lyon on the A6, exit 5: Caluire-et-Cuire, near Lyon Convention Center at Cité Internationale, which is accessible in just 12 min via Passerelle de la Paix. From Lyon Part-Dieu TGV train station, take the C1/C2 bus to St Clair Square Brosset. Our hotel has an enclosed garage (charges apply), unlimited free WIFI, restaurant, 114 spacious, air-conditioned rooms, a web corner and 24-hour reception and snack bar. A short walk from the Cité Internationale and the Tête d'Or park, our 3-star hotel, is located at Caluire-et-Cuire, espace St Clair Square Brosset, close to the Rilleux-La-Pape business area. 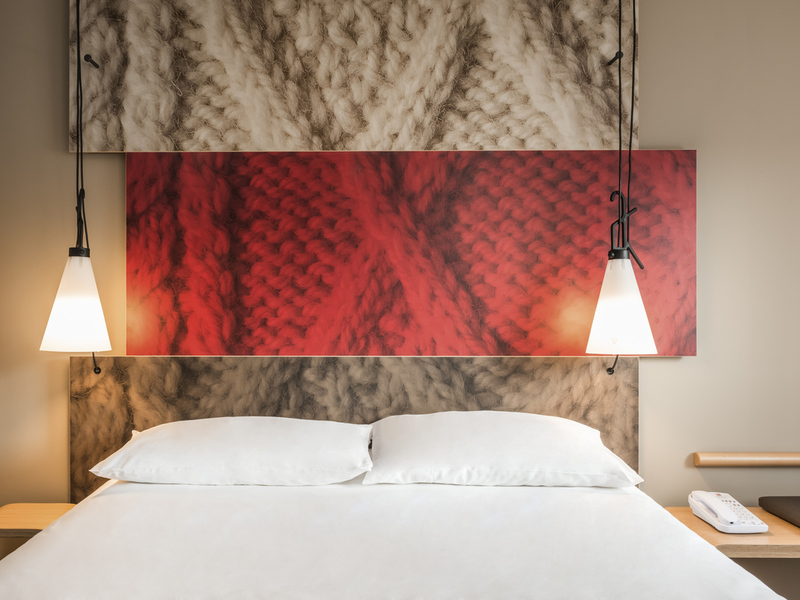 With 114 rooms, our hotel offers optimum comfort during your overnight stays thanks to the Sweet Bed by ibis bedding concept, with mattress topper. Equipped with a flat-screen TV, closet, and bathroom with hair dryer. Come and savor a lovely glass of wine, carefully selected by our sommelier Alexandre. Then, our entire restaurant team will be delighted to welcome you to our ibis Kitchen restaurant to enjoy its traditional dishes. People gather at the bar at all times of the day for a bit of me-time. Foodies will love our "Petites Faims" menu with its famous snacks, which can be enjoyed in the bar or in your room.